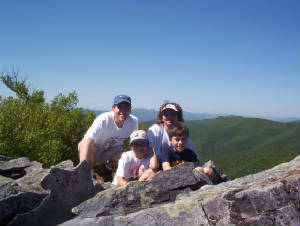 Sue and her family hiking in the North Carolina mountains. I am Sue Patrick, a home school mom, with a Bachelor’s Degree from North Carolina State University. While in the process of pursuing a Masters Degree from NCSU, my oldest child was diagnosed with Autism at the age of two. His diagnosis was a crushing blow to my husband and myself, and I found myself caught between two worlds. One in which I was grieving the loss of the child I had hoped and prayed for for 10 years. And another world in which I was determined to do everything humanly possible to help this child, whom suddenly I didn’t think I knew. I had been completely consumed with the world of infertility and adoption. When our son arrived, he was truly bigger than life and everything we had ever wanted. As I watched him develop over the first 15 months, not only did I not realize, as a first time mother, that he had a severe disability, I actually thought he was incredibly gifted and talented. My hopes, prayers and perceived future for him were unlimited. He was the perfect and beautiful child I had always wanted. But when he was diagnosed, I realized that all those prayers and ideas of who he would become and what would be his future, were to be crushed. I had to re-order my prayers and hopes for a complete unknown. No one could tell me what my son could achieve, if he would ever talk, interact or learn anything, much less academics. I did not stay in the world of grief for very long. My instincts for survival and hopes for my son took over. My son’s progress became the most important thing in my life. My priorities were not balanced. My God nor my husband came first. I do not remember much about my daughter’s first year (she was born just as my son was going through the process of diagnosis). I spent the next 8 years pursuing my son’s improvement, balance in my life, and an understanding of home schooling, including the special needs child. Initially I spent all day long raising two small children as best I could, and most of the night researching and making materials and curriculum to help my son grow and develop to his greatest potential. I had such great success with his progress, that I began showing other families with children with developmental disabilities what I had learned, and what was working so very well for my son. Over time, with a lot of trial and error and changes—always seeking to understand and improve a system I was developing, I was able to share with more and more families. My son, who was never considered high functioning, began to function at a very high level—even though he has a language disability that almost seems insurmountable. Through this system, he has learned so well that he is academically on grade level with his typical peers, —he participates in groups and social activities, independently, with his typical peers— he participates in sports teams, independently, with his typical peers. I believe this is all due to what I have been able to glean from all existing therapies, theories, and educational plans and implement as a home program. After attending seminars, conferences, and certification programs for nearly every therapy based work for special needs children, I did not adopt any existing program or other therapies because I thought a meshing of the best of all programs, along with a Specialized Parent-Based approach was the only logical choice. I am thankful to God every day for giving me that discernment. After showing an uncounted number of families how to successfully work at home to create their best home school and improve their children who ranged from “too wiggly” to severely disabled to just plain large numbers of children in their home, I found that I simply did not have the time to reach as many people as would call me for help. So a friend and I decided what was needed was a Special Needs Home Schooling Conference. We incorporated ourselves and began at the beginning. The result was www.GIFTSNC.com and a large first annual conference and successful subsequent conferences. Every plan has fallen into place, and we are able to reach and help so many more special needs home schoolers than we could ever have reached otherwise. I have now packaged my system, Specialized and Structured TeachingSM Workbox SystemSM in an effort to reach even more families working to achieve the highest academic and cognitive potential they can in their own children. This system works very well with all home schools and all children ranging from “typical” to disabled. Additionally, I have now written a User's Guide for my Workbox System so that you may now use my system in your home without the need to attend one of my seminars or hiring me for my services personally.